Alpha Starter Set, Rolls. Compatible with Jeter 5100 system. Size: 15/16" H x 1 5/8" W. A-Z + Mc. 14,000 labels per set includes a roll of 500 yearbands. These Jeter match labels are polylaminated to keep colors bright and labels soil free. Scored for easy application. 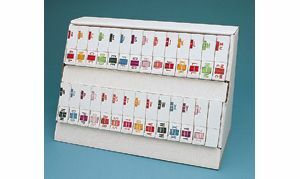 Colors: First portion of alphabet, solid colored labels: A-red, B-lt orange, C-dk orange, D-lt green, E-dk green, F-blue, G-violet, H-lavender. Second portion of alphabet, colored label with one white bar: I-pink/white, J-red/white, K-lt orange/white, L-dk orange/white, M-lt green/white, Mc-brown, N-dk green/white bar, O-blue/white, P-violet/white, Q-lavender/white, R-brown/white. Third portion of alphabet, colored label with two white bars: S-pink/white, T-red/white, U-lt orange/white, V-dk orange/white, W-dk green/white, X-blue/white, Y-violet/white, Z-lavender/white.